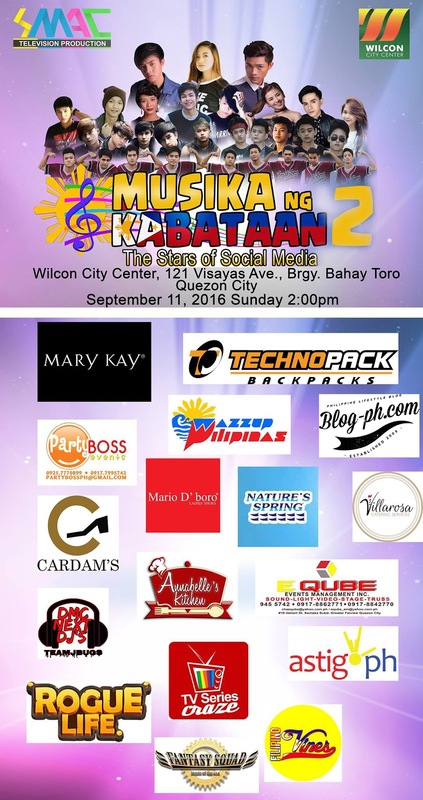 Blog-Ph.com is one of the media partner of "Musika ng Kabataan 2: The Stars of Social Media" presented by SMAC Television Production and Wilcon City Center for the benefit of Gawad Kabataan Pilipinas Charity Program. This event is a gathering of social media sensations and a chance for the fans to mingle with their social media idols. Performers includes: Brusko Bros, Marlou S Arizala, Angelica Feliciano, VMiguel Gonzales, Yna Magenda, Greco Gonzalo, Laimer Matsumoto, Jestin Manalo, Christian Patrick Salonga, Sceven C. Nolasco, Leslie Santos Diaz, Almer Cason, Deej Altea, Stephenjay Delrosario Illustrisimo, Shiro Ogawa, Jaimel Patrick Gonzales Berbano, Dale Joshua Dela Cruz, Sharlene Jane Dela Rosa, Jestony P. Alipda, CAP Circle of 12 and other surprise guest. Happening on September 11,2016 (Sunday) around 2:00PM at the Wilcon City Center (121 Visayas Avenue, Bahay Toro, Quezon City) Hosted by: Justin Lee, Eunice Patricia and Mateo Sanjuan. Co-Presented by: Mary Kay and Technopack. Sponsored by: Rogue Life, Mario D' Boro, Cardam's Shoes, Annabelle's Kitchen, Villarosa Catering Services, Nature's Spring Water, Fantasy Squad - Philippines, DMC Next Dj's, E Qube Event Management Inc, and Party Boss Events.